I left my appendix in Buenos Aires… but Argentina was not only about my appendix as we will also remember the country for its beautiful sceneries, Ruta 3 (the long windy boring road), superb meat and great wine. 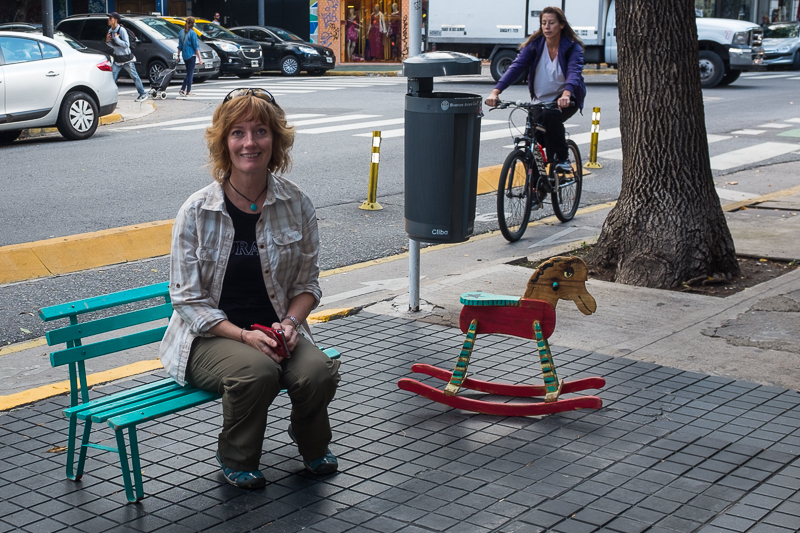 We crossed the Chile and Argentina border seven times as we were crisscrossing our way down to Ushuaia, which is the southernmost city in the world. Every now and then two becomes three. Here we met our friend Brendan that we rode with for a few days. Brendan, our Irish friend that we met many times during our trip through South America. We had some really bad weather in Argentina. The photo below is from the north part of the country. We were riding south when we saw something dark coming our way. It started with a sand storm and later the rain… and I mean rain like, ‘It’s raining dung head-first’ ( the way they say in Argentina) which means it rains cats and dogs. We were riding with Brendan at the time and we could hardly see in front of us. Poor Brendan he was totaly soaked and forgot that he had all his money and mobile phone in a pocket that was not waterproof. He later placed everything on his bed to dry, but his mobile phone was dead and still is. If you only visit one glacier in your life, we would for sure recommend going to the majestic Perito Moreno. It’s really impressive, spectacular and quite easy to access on a daytrip from El Calafate, about 75km away. One “cool” fact is that the Glacier Perito Moreno is one of three glaciers in the world that are still growing. The Perito Moreno Glacier, named after a 19th century explorer, is currently about 30 km long, 5 km wide and 74 meters above the Lago Argentino… but it also reaches a total depth of 170 meters below the lakes surface. The Glacier is part of a greater ice field located in both Argentina and Chile, which is the third largest reserve of fresh water in the world. At last we reached Ushuaia, which is the southernmost city in the world. It had been very along ride from Alaska to Ushuaia and I would lie if I didn’t say that we were tired. Now we had to turn around and go north again. In Argentina we came across many shrines built alongside the roads. We asked about the reason for leaving bottles of water by the road and were told about Difunta Correa. The legend holds that a woman, Deolinda Correa’s husband was forced to join the military around 1940. Deolinda, set off across the grasslands carrying her child. She died of thirst in the desert but before she died, she set her child to her breast and, miraculously, the child survived. A few days later, Deolinda’s baby was found. Many people believe Deolinda’s breast never dried out, despite her death. Today Argentineans build small altars along the way and leave lots of bottles of water for Deolinda, which today is named Difunta Correa, in order to “calm her eternal thirst”. This is just one of many stories about the water bottles. Punta Tombo National Reserve is a peninsula on Argentina’s central coast, which is known for its huge colony of Magellanic penguins. I thought penguins were supposed to live in the cold, on snow and surrounded by icebergs. 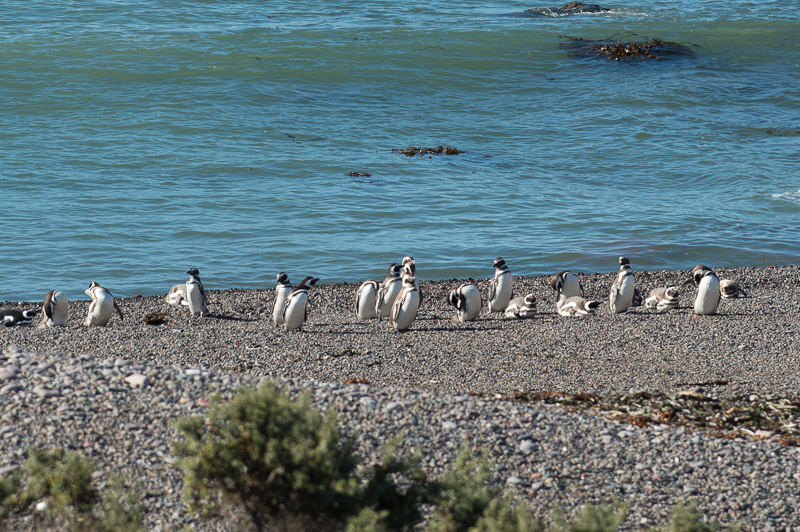 But in Punta Tombo I learned that they also standing in the dunes, far from the water, in direct sunlight and 30 degrees… This was not exactly what I expected from a penguin colony. 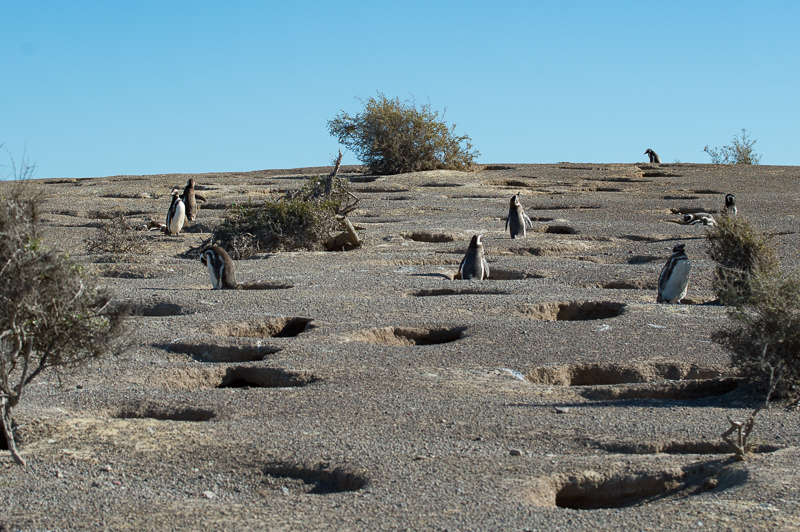 Nevertheless, when we were walking on the gravelly terrain we saw a countless number of cute penguins that nested everywhere in small burrows. Petra got a new friend, a very curious little friend. The screaming armadillo, is a burrowing armadillo found in the central and southern parts of South America. The adjective “screaming” derives from its habit of squealing when handled or threatened. 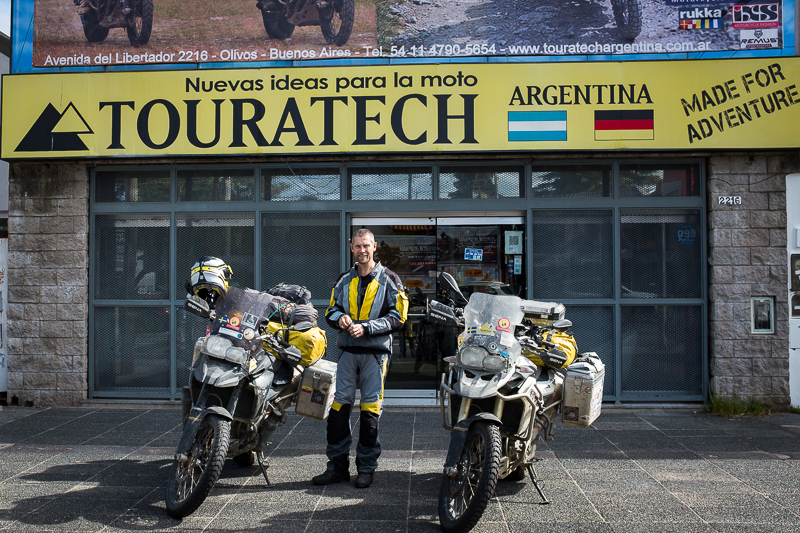 Ruta 3 from Ushuaia to Buenos Aires must be the most boring road (3000km) on earth. Ruta 3 must, by far, be the most boring road on earth or at least what we have come across during our plus three years around the world. There is really nothing to see. After a couple of days we came a cross a tree…. and we were super excited…. that might describe how bored we were. When I woke up the day after I felt a bit under the weather and thought a long walk, around Buenos Aires, would do the trick to make me feel better. When we had walked a few kilometers, I was getting a stinging ache in my stomach and after about ten kilometers the pain got worse. We now really had to ‘rush’ back to the hostel. It was rather stupid of us to walk the whole way back but if you are on a budget you are on a budget 😉 Finally back, Anders told me that I looked very pale and at this point I was very dizzy and had difficult to stand up. Anders thought we should go to the hospital immediately, but I insisted that we should wait and see if I got better. However, luckily Anders just went out to the owner of the hostel and asked if they could call for a taxi. When the owner saw what condition I was in, he wanted to call for an ambulance instead… I refused so we took a taxi to the hospital. At the hospital we were told that they wouldn’t treat me until our insurance company had approved it. As we didn’t get an answer from the insurance company we decided to pay for the scan and ultra sound ourselves. After that they wanted to do a tomography that would cost $900, so we tried once again to contact the insurance company and at last we got that scan approved. The problem was that they gave an approval each time something needed to be done, so it took an awful lot of time. The doctor came back with the results and if we understood the doctor correct, then my appendix was very large and I needed surgery immediately. NOW the real hassle with the insurance company started. Poor Anders, I think he wrote about 20 emails and call them via Skype several times on a very poor Wi-Fi. After 18 hours of hell it was finally approved. Just 10 minutes before we got the surgery approved the doctor came and said that they didn’t have place for us in the operating theater and that we had to leave for the state hospital… It is not very often Anders gets angry but now he became furious so I had to try to calm him down. However, Anders managed to persuade the staff that we were not leaving the hospital and suddenly I was transferred to a very fancy room, which even had a sofa in it. When I woke up after the surgery, Anders told me that the first thing I said was “were is my motorcycle”… guess I have the priorities right hehe. Very early the next morning I woke up to go to the toilet, but wasn’t aware of that I was ‘connected’ to a bag of fluid. Of course I managed to drop the bottle. It hurt like hell when the needle moved in my arm. Now Anders, who was still asleep in the sofa next to me, woke up. To wake Anders up that suddenly is never a good idea, as he totally freaks out and is completely disorganised. So still half asleep, he tried to pick up the bag, but dropped it again and I was screaming like mad because of the pain. A nurse opened the door and asked what was going on…. I was strictly told off that I was not allowed to walk to the toilet by myself…. I kind of understood that by now. After nearly a week I was discharged and we took a taxi to the hostel, only to pack everything and leave for an apartment where we could stay until I was fit enough to ride my bike again. Anders rode my bike the 5 km to the apartment that we had rented and put me in a taxi with my handbag and helmet. The taxi guy dropped me off, where I thought the apartment was, I saw the taxi disappear and realized that I was at the wrong place. There I was standing with my tiny handbag and the helmet, which felt extremely heavy, and I was in such a pain. I walked slowly, slowly, bent like a very old woman following the direction to the apartment on my mobile. Suddenly my mobile was running out of battery and the brightness on the screen turned down, and together with the bright sunshine it was nearly impossible to see the map on the screen. Luckily after a very, as it felt, long walk I reached a place that looked like what Anders had described it. I went to the door and the doorman, yes there was a doorman, came and opened the door and said, ‘Anders’ and I very tired said yes. I took the elevator up and opened the door to the most beautiful apartment. I closed the door and stared at the little kitchen, the toilet and shower and the BED….. In the middle the pain I felt like the luckiest person in the world. Due to a few complications after the surgery we had to stay in this apartment for a whole months before we could leave for Uruguay. 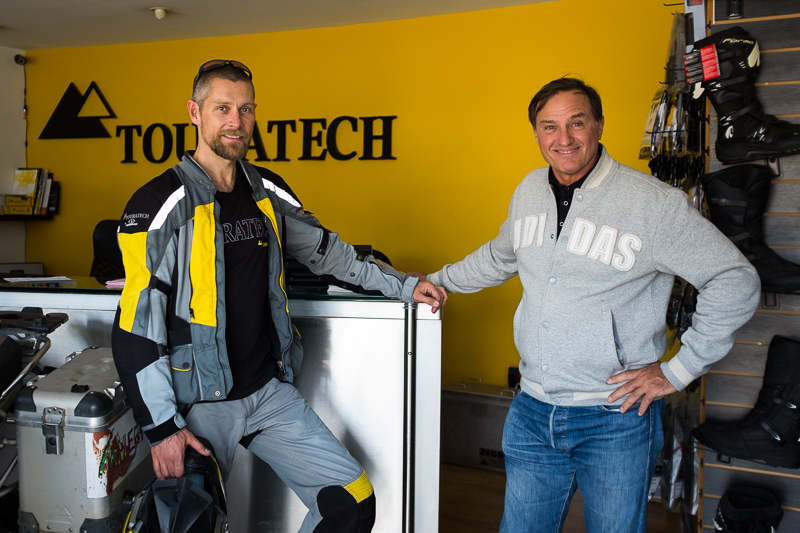 As always we try to visit Touratech around the world and the shop in Buenos Aires was no exception. Yes we had lots of rain after we left Buenos Aires and at this time we didn’t know that we were going to get even more in Uruguay which is the next country. So this was about our time in Argentina, next up Uruguay. What adventures you have had. I am glad that you survived hospitalisation, never a cheery prospect. I love the photographs that you take on your way. 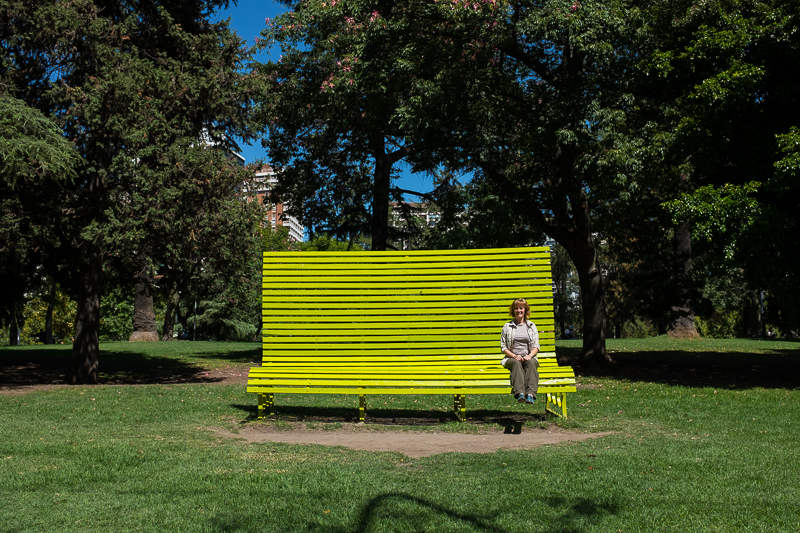 Wow – what a story! Hope the next part of your story and travel unfolds less dramatic! Safe travels!